Yesterday, a weird thing happened. Something that hasnt happened in the history of the apps, from as far as I can tell. A card was added to the sheet that was part of a set that had completed a long time ago. 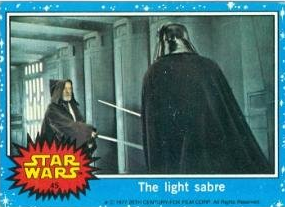 The infamous card 45, part of the 1977 set, title “the Light Sabre” had been missing to this day, leaving many set collectors feeling slighted and incomplete. Although it was never stated WHY the card was never inserted, its pretty clear that there was some situation in approvals that prevented the card from hitting packs. There are a lot of theories as to why this is the case, stemming from the spelling of Lightsaber as “Light Sabre”, or even that the blades of the lightsabers werent really shown as “on.” Being that the card was created in 1977, things have changed significantly in the branding of the universe. This obviously led to issues with getting the cards into packs in a timely fashion, causing immeasurable amounts of dissatisfaction from the people who had collected the set all the way through. Although PERSONALLY, I thought the controversy was FAR overblown, im glad there is resolution for the 1400+ people who were awarded the final piece to their 1977 collection. If the card was released on time, during the course of the set, it would have value on par with the other examples from the 1977 set. Now, this card is something of legend, meaning that the value has increased to match the firestorm that occurred with the card itself. Card 45 will go down in the annals of the app as “one of those things,” and because there were so many people who collected the set, there are a lot of users who will be happy with their new collection piece. Similarly, I think this was handled very well by the Topps team, who stood their ground and obviously responded to the community’s desire for the card to be released. I think that they easily could have walked away with whatever situation was going on, and just wrote off the eventual completion of the 1977 program. Instead, its clear that they worked through whatever approval challenge there was so that the users could get the card they had been so outraged over. Its not an ideal situation, but it is a situation that should show that they do listen to what is going on. The app will NEVER be perfect, and the community will NEVER be completely satisfied. However, its nice to see something like this happen every once in a while. This entry was posted in Uncategorized and tagged Baseball Cards, Bunt, Football Cards, Huddle, Sports Cards, Star Wars, Star Wars Card Trader, topps, Topps Bunt, Topps Huddle, Topps Star Wars. Bookmark the permalink. 1 Response to The SWCT 1977 Debacle is Finally Over: Card 45 Arrives! Hopefully GM is next on the list of things to fix.